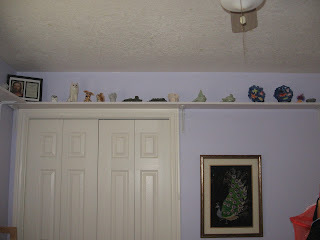 John and I put up some new shelves in the girls' room. They line 2 walls of the room and the girls are putting their pottery, statues, nicknacks, and other random things that they don't want touched up there. I am happy with the way they turned out. Now we need to get their room new blinds. You can see the peacock embroidery we found at a garage sale on the wall as well.